Using both Mac and PC platforms, we employ the latest direct-to-plate (computer-to-plate, or CTP) technology that allows us to accept clients’ files or disks in the most recent versions of Quark, Photoshop, InDesign, Illustrator, Acrobat Professional or Word. 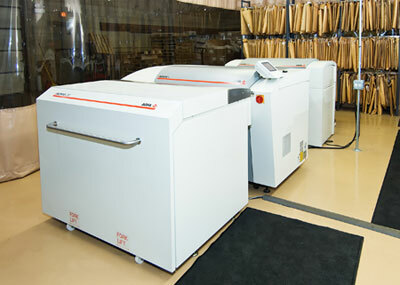 We calibrate our color management system weekly to ensure accuracy and consistency. Before we run any new job, we first create PDF proofs that we e-mail to our clients, or we can send the client a hard copy proof so they can sign off on the project with confidence. When we receive the OK to print, we use the color proof from our Epson color management system for color match on press. Our state-of-the-art ink doser allows us to match the most unique colors and replicate everything on subsequent runs.